Running from O’Sullivan Avenue to what used to be Annesley Motors on Ballybough Road are four single-storey red-brick Victorian houses. Weeds poke out of the roofs of numbers 22B and 24. Corrugated iron blocks the windows and doors of number 23 and number 24. An early election poster is pasted on the door of 24. Dandelions peek up on its porch around a discarded red sleeping bag. A sign on number 23 reads “RFC Security Patrol this site” and there’s a warning that “trespassers will prosecuted”. Weeds have overgrown to the point that the contact number on the sign is nearly invisible. 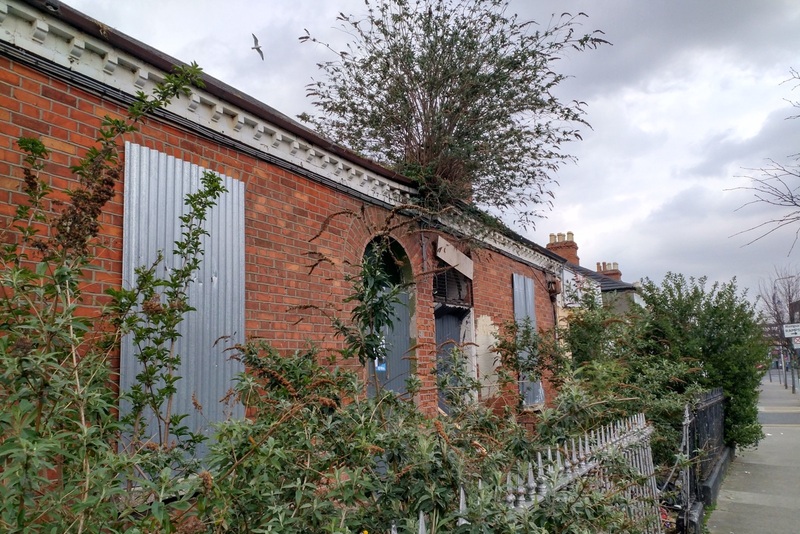 The weedy-roofed building at 22B on Ballybough Road was put onto the derelict sites register in June 2009, says a spokesperson for Dublin City Council. Numbers 23, 24 and 25 only joined it on the register in July 2017. Lynam is not sure when people last lived in the houses. 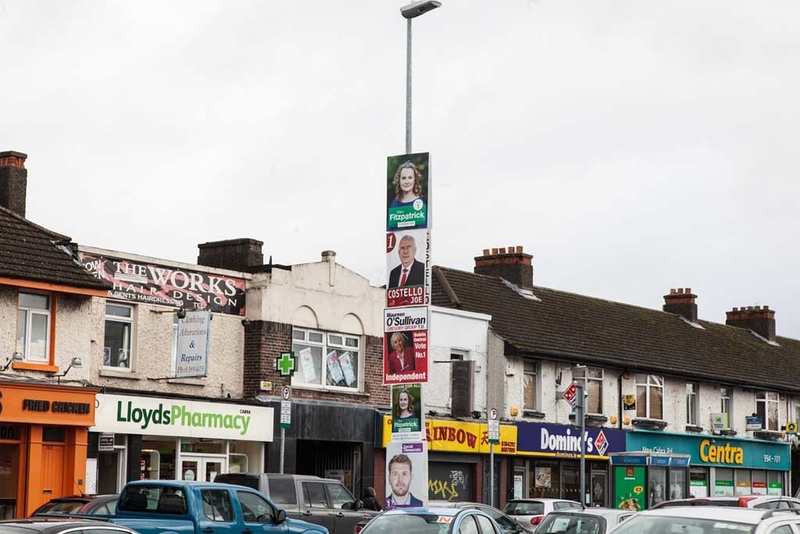 But they were owned by the owners of Annesley Motors, he says, which is beside the houses and completes the strip of buildings running from O’Sullivan Avenue to Clonliffe Avenue. There was a tyre and valeting company there, says Lynam, but it was given notice to leave earlier this year. 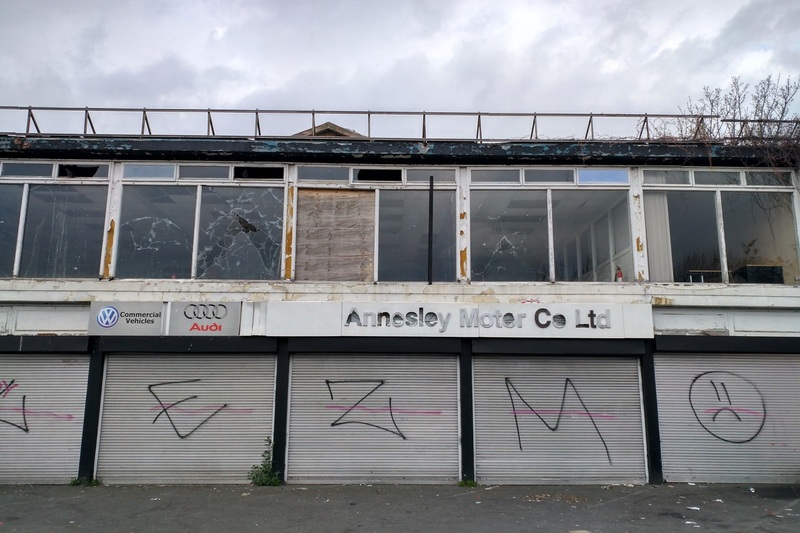 The sign for Annesley Motors has started to fade away on the long white building that once was the company’s salesroom. Windows on the second floor are broken. Some are boarded up with chipboard. The closed grey shutters have been tagged. “Apparently it’s all been sold,” Lynam says. In fact, it had been sold in 2016, and three years later it’s back on the market for 293 percent more. The site of the former Annesley Motors showrooms, as well as 22B to 25 are all owned by Balmar Property Ltd, according to a Dublin City Council spokesperson. The previous owners of the sites, Maybourne Company, went into receivership in 2014. (Jason Byrne, one of the directors of Maybourne Company was also one of the directors of Annesley Motors). “Aungier Street Partnership” bought the sites in November 2015, according to a receiver’s abstract, for €1,400,763. Although no information can be found on Aungier Street Partnership, Sean Browne, who was secretary of a now dissolved company called Aungier Street Investments Limited, is one of the directors for Balmar Property Ltd, the current owners. Balmar Property Ltd was incorporated in 2016. Its other director is William Quinlan. Its main shareholder is Adlucem Investments Ltd. The directors of Adlucem Investments Ltd are Sean Browne, Martin Doran, Neil Monahan, Caroline Meehan. Monahan was also briefly a director of Balmar Property, until mid-January 2019, at which time he was also a director of Doyles Hotels (Holdings) Ltd.
Balmar hasn’t responded to queries. The site has been for sale since November 2018 with a price tag of €5.5 million, a jump of €4 million in less than three years. It could fetch more, given the city’s hot land market – and the possibility for “valuable” intensive uses on the site, rather than apartments. Examples elsewhere in the city show how much more profitable student housing – with lower standards and no need to set aside some for sale to the council for use as social housing – is than “normal” apartments. Last year, Dublin City Council sold land in Ballymun to Lidl for €2.4 million so it could build a foodstore and student housing complex of 364 beds. Lidl sold the 364 beds on for more than its €46 million guide price, which means more than €126,000 a bedspace. If four student rooms are a similar size to a two-bed apartment, then to make roughly as much money, a developer would have to sell a two-bedroom apartment in Ballymun for more than €500,000. Cushman and Wakefield’s advert for the 0.69 hectare site in Ballybough says it has full planning permission for a mixed-use scheme. But a feasibility study has been carried out “displaying the potential for a student accommodation scheme comprising 285 bed spaces”, it says. Independent Councillor Christy Burke says he strongly objects to having more student housing in the area. He says that he’d like to see that land used as a mix of affordable and social housing. A section of a senior-citizen complex. “Aldi or Lidl were supposed to go in but they didn’t have the permission for an off-licence, or maybe a car park,” says Margaret Gannon, who lived in Ballybough for 50 years. She said she heard from local councillors that it was going to be developed as student housing. Anything is better than now, she says. Under the city development plan, the site is zoned as Z3, “to provide for and improve neighbourhood facilities”. In 2006, planning permission was granted for the destruction of the showrooms and numbers 22B to 26 for the construction of a six-storey building, car park, six ground floor retail units as well as 46 apartments. The planning permission was not acted upon and three years later Maybourne sought planning permission with some modifications, the main one being the amalgamation of the six ground-floor retails units into three. Maybourne again sought planning permission in 2012 for a two-storey building, retail units an an accompanying off-licence. However there was a number of complaints regarding the off-licence and permission was denied. 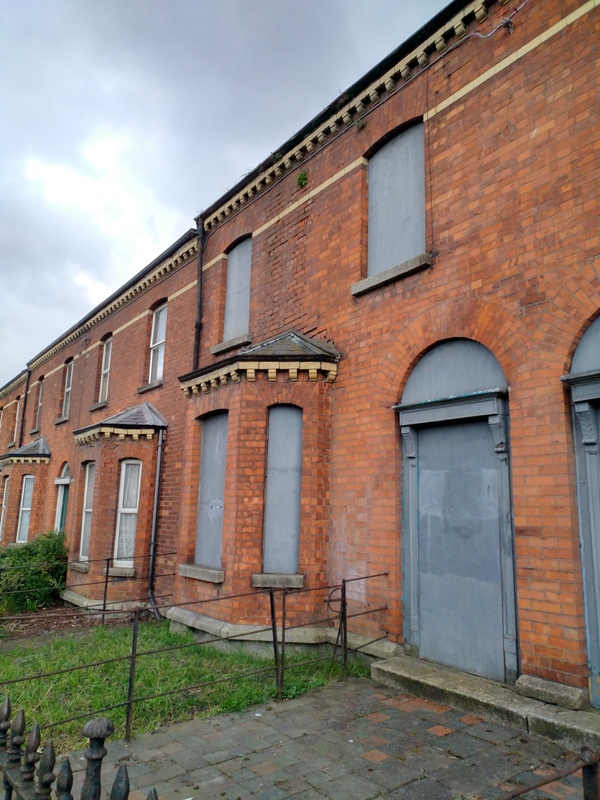 According to a council spokesperson, the council had been talking to Balmar Property Ltd about acquiring the sites on the register under the Derelict Sites Act, 1990. But “these sites were placed for sale in the open market in November 2018 and acquisition proceedings were put on hold by the Council”, said a council spokesperson. The council hasn’t responded yet to a query asking if they have applied a financial penalty to the owners of the properties. Under the Derelict Sites Act property owners can be charged as much as 3 percent of the market value of the derelict site for every year it is on the register. “With property values growing over three percent, there’s no incentive to do anything,” says Costello.